By admin on September 1, 2018	in rear. Permalink. (lower 48 states only). Makita 18-Volt X2 LXT Lithium-Ion (36-Volt) Brushless Cordless Rear Handle 7-1/4 in. BL Motor delivers 5,100 RPM and 50% longer run time per charge. Up to 558 cross-cuts per charge with two 5.0Ah batteries. Brushless motor eliminates carbon brushes for longer tool life. Makita, a pioneer in brushless motor technology and battery innovation, combines both in the 18-Volt X2 LXT (36-Volt) Lithium-Ion Brushless Rear Handle 7-1/4 in. It’s powered by two 18-Volt LXT Lithium-Ion batteries for maximum performance and has an electronically-controlled BL Brushless motor that matches torque and RPM to the application. Makita 18-Volt X2 means freedom from the cord, even for demanding applications like cutting sheet and dimensional lumber that traditionally called for a corded saw. Best of all, users can remain in one battery platform, using the same fast-charging 18-Volt batteries with the XSR01Z as they use across the expansive Makita 18-Volt LXT cordless tool series. The XSR01Z has a long list of features for efficient cutting without the cord. Users of leading corded saws will appreciate the blade-left rear-handle design. The electronically-controlled brushless motor delivers a full 5,100 RPM for efficient cutting. In internal testing, the XSR01Z made up to 558 cross-cuts per charge in 2×4 SPF lumber using two fully-charged 5.0Ah batteries. Added features include a large 2-9/16 in. Cutting capacity at 90° that will cut 3X lumber in a single pass and an electric brake for maximum productivity. Powered by two LXT batteries; X2 LXT technology delivers more power, speed and run time without the hassles of a cord. Makita built electronically controlled BL Motor delivers 5,100 RPM for maximum performance and 50% longer run time per charge. BL brushless motor eliminates carbon brushes, enabling the BL motor to run cooler and more efficiently for longer life. Automatic speed change technology adjusts cutting speed and torque during cut for optimum performance. X2 LXT technology delivers up to 558 cross-cuts per charge in 2 x 4 SPF lumber and up to 291 cross-cuts per charge in 2 x 10 SPF lumber using two 5.0Ah batteries (batteries not included). Cutting capacity at 90°; cuts 3X material in a single pass. Electric brake for maximum productivity. 0°- 53° bevel capacity with positive stops at 22.5°, 45° and 53°. Die-cast magnesium base and blade guard along with a die-cast aluminum blade cover and motor housing provide a lightweight, durable design. Compact and ergonomic design at only 17-1/2 in. Weighs only 12.4 lbs. With batteries (batteries not included) for reduced operator fatigue. Ideal for framers, formers, builders, roofers and more. Equipped with Star Protection Computer Controls to protect against overloading, over-discharging and over-heating. Retractable tool hook secures the tool when not in use. Rubberized soft grip handle provides increased comfort on the job. Extreme Protection Technology (XPT) is engineered for improved dust and water resistance for operation in harsh conditions. 3-stage LED gauges indicate battery charge levels. 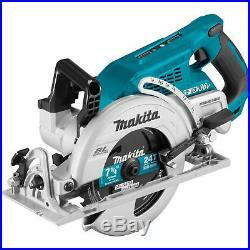 The item “18V X2 LXT 36V Rear Handle 7-1/4 Circular Saw (Tool Only) Makita XSR01Z New” is in sale since Sunday, August 12, 2018. This item is in the category “Home & Garden\Tools & Workshop Equipment\Power Tools\Saws & Accessories\Circular Saws”. The seller is “ste_bksksy” and is located in Katy, Texas. This item can be shipped to United States, Canada, United Kingdom, Denmark, Romania, Slovakia, Bulgaria, Czech republic, Finland, Hungary, Latvia, Lithuania, Malta, Estonia, Australia, Greece, Portugal, Cyprus, Slovenia, Japan, China, Sweden, South Korea, Indonesia, Taiwan, South africa, Thailand, Belgium, France, Hong Kong, Ireland, Netherlands, Poland, Spain, Italy, Germany, Austria, Israel, Mexico, New Zealand, Philippines, Singapore, Switzerland, Norway, Saudi arabia, Ukraine, United arab emirates, Qatar, Kuwait, Bahrain, Croatia, Malaysia, Brazil, Chile, Colombia, Costa rica, Dominican republic, Panama, Trinidad and tobago, Guatemala, El salvador, Honduras, Jamaica, Antigua and barbuda, Aruba, Belize, Dominica, Grenada, Saint kitts and nevis, Saint lucia, Montserrat, Turks and caicos islands, Barbados, Bangladesh, Bermuda, Brunei darussalam, Bolivia, Ecuador, Egypt, French guiana, Guernsey, Gibraltar, Guadeloupe, Iceland, Jersey, Jordan, Cambodia, Cayman islands, Liechtenstein, Sri lanka, Luxembourg, Monaco, Macao, Martinique, Maldives, Nicaragua, Oman, Peru, Pakistan, Paraguay, Reunion.